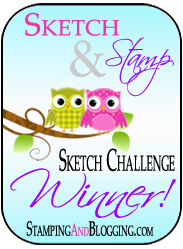 Hi Stampers, last Thursday during our Happy Stampers Blog Hop I shared my card using a sketch challenge. I made two cards for the hop, not knowing which one I would use. I ended up showing you the “Star of Light” card. Today I wanted to share with you the other card I made using the “Candy Cane Christmas” stamp set utilizing the same sketch. This sketch was from last weeks Happy Stampers Blog Hop. I adhered the large red and DSP mat to the card base. I stamped my 3 small art piece panels using the Candy Cane Christmas in Early Espresso, Real Red and Crumb Cake inks. I then mounted those 3 pieces to the real read mats and added dimensionals I then adhered it to the DSP mat, followed by the red mat. Before I attached this to the main card I wrapped three stands of the Candy Cane Lane Bakers Twine around the bottom front of the card. I then attached that whole piece with dimensionals to the Whisper White card base. I stamped the Gingerbread couple using the Cookie Cutter Christmas s tamp set on Whisper White card stock with Early Espresso ink and punched them out with the coordinating Cookie Cutter Punch. I did the same for the little red bow using Real Red ink and the punch. I adhered the lady gingerbread first and then put some dimensonals on the boy gingerbread to have him pop a bit. I cut a piece of Whisper White card stock 1/2 x 3-1/2 and stamped the sentiment from the Candy Cane Christmas stamp set in Early Espresso. Using the Candy Cane Lane Bakers Twine I tied a triple bow and attached it to the front of the card. Pearls were added to the center of the snowflakes and rhinestones were added to the middle of the mitten. Just adorable, Kristi! Love,love, love those little gingerbread people, too. Super DSP you created! Hi admin ! I read your website everyday and i must say you have very interesting posts here.